Help us celebrate our 12th Annual "Tee Off For Tierra!" 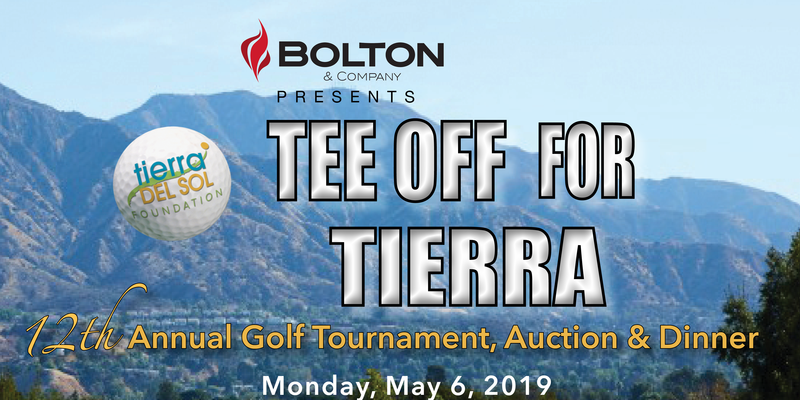 Charity Golf Tournament, benefitting the more than 700 people with developmental disabilities that Tierra empowers each day through Workforce Development, College to Career and Careers in the Arts. This year's tournament will take place at the Angeles National Golf Club in Sunland. Registration fees include cart, swag, BBQ lunch, on-course beverages and dinner. Two foursomes, four additional tickets for reception and awards dinner, three chances to win a mulligan raffle grand prize, four on-course tee signs, full page ad in Tribute Journal, logo recognition on website and marketing materials, banner displayed on course and at reception and awards dinner, and promotional ads in the Los Angeles Daily News. Two foursomes, three additional tickets for reception and awards dinner, three chances to win a mulligan raffle grand prize, four on-course tee signs, full page ad in Tribute Journal, logo recognition on website and marketing materials, banner displayed on course and in golf carts, and promotional ads in the Los Angeles Daily News. Two foursomes, three additional tickets for reception and awards dinner, three chances to win a mulligan raffle grand prize, four on-course tee signs, full page ad in Tribute Journal, logo recognition on website and marketing materials, banner displayed on course and in BBQ lunch area, and promotional ads in the Los Angeles Daily News. One foursome, company logo printed on Golf Pin Flags throughout course, two chances to win a mulligan raffle grand prize, two on-course tee signs, half-page ad in Tribute Journal, logo recognition on website and marketing materials, banner displayed on course, and promotional ads in the Los Angeles Daily News. One foursome, company logo printed on golfer swag bags, two chances to win a mulligan raffle grand prize, two on-course tee signs, half-page ad in Tribute Journal, logo recognition on website and marketing materials, banner displayed on course, and promotional ads in the Los Angeles Daily News. One foursome, one chance to win a mulligan raffle grand prize, one on-course tee sign, third of a page ad in Tribute Journal, and logo recognition on website and marketing materials. 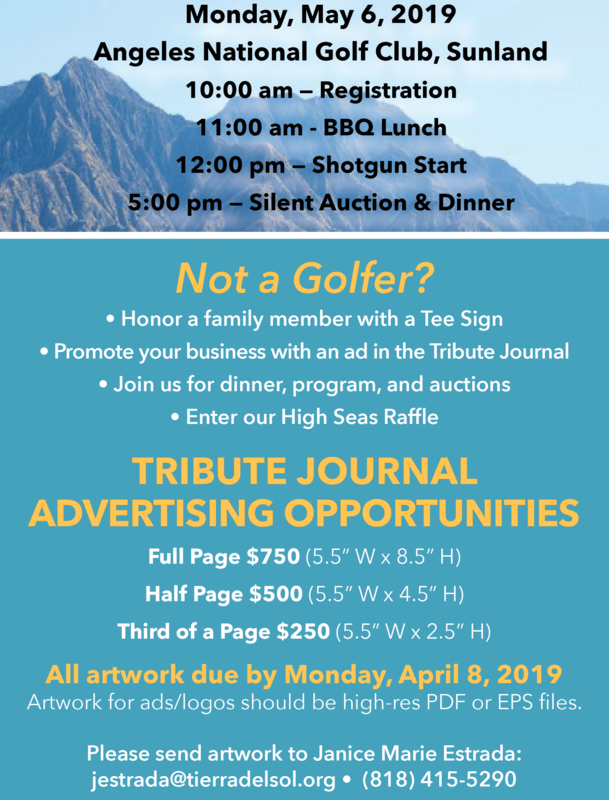 Four dinner tickets, full page ad in the Tribute Journal, tee sign, slide featuring logo with mention at podium, and logo on dinner table signs. Two dinner tickets, special recognition at auction and cocktail reception, and third of a page in Tribute Journal. Surf and turf with unlimited wine! 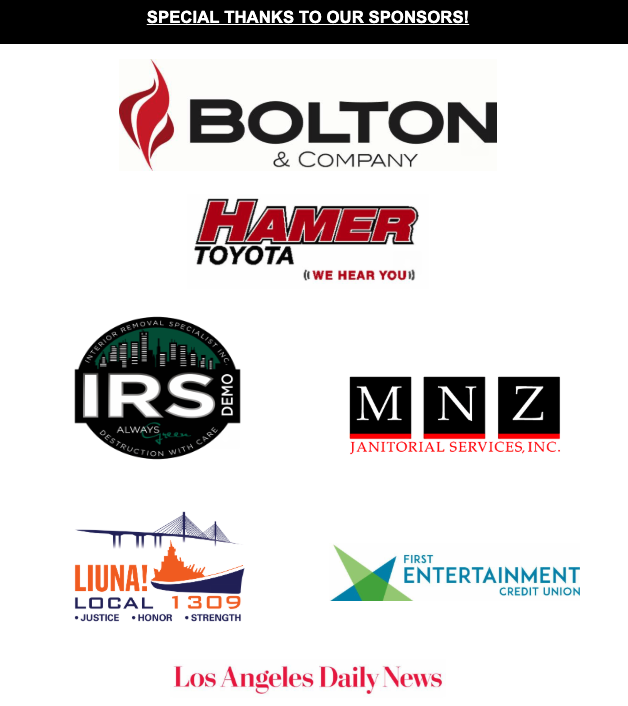 Click here to make a donation to our tournament! Please make sure to designate your gift to "Golf Donation." 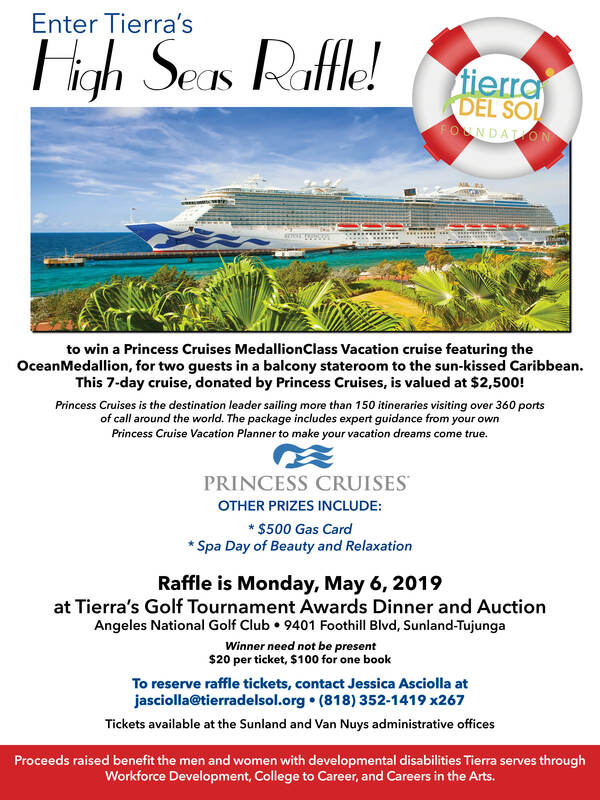 If you have any questions regarding our upcoming tournament, please contact Event Specialist, Jessica Asciolla: jasciolla@tierradelsol.org or (818) 352-1419, x267. The fair market value of goods and services is $165.00 per golf participant and $60 per “dinner only” guest. Under current IRS regulations, charitable deductions are limited to the amount paid in excess of the value of the goods and services provided. CLICK HERE TO DONATE TO OUR AUCTION!